American teachers work hard. Like, really hard. This year's education report from the Organisation for Economic Co-operation and Development outlines the state of education in the world's most developed countries. It finds that American elementary school teachers spend more hours actually teaching students than peers in any other surveyed country. American middle school and high school teachers spend more time educating students than peers in every OECD country except Chile, according to the report. In addition to classroom time, U.S. teachers are required to be at school for more hours than most of their international peers. Despite the long hours, American teachers aren't well compensated, Andreas Schleicher, OECD director of education and skills, explained in a call with reporters Monday. While U.S. raw teacher salaries are high compared with the rest of the world, the pay lags behind that of similarly educated American workers. 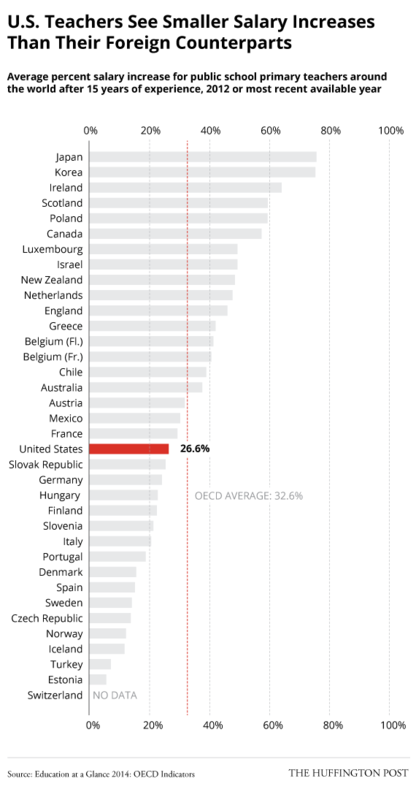 “Teacher pay relative to other countries, in absolute terms, is quite competitive in the United States," said Schleicher. "But when you look at this relative to the earnings of other people with college degrees, actually the United States is pretty much at the end of the scale." 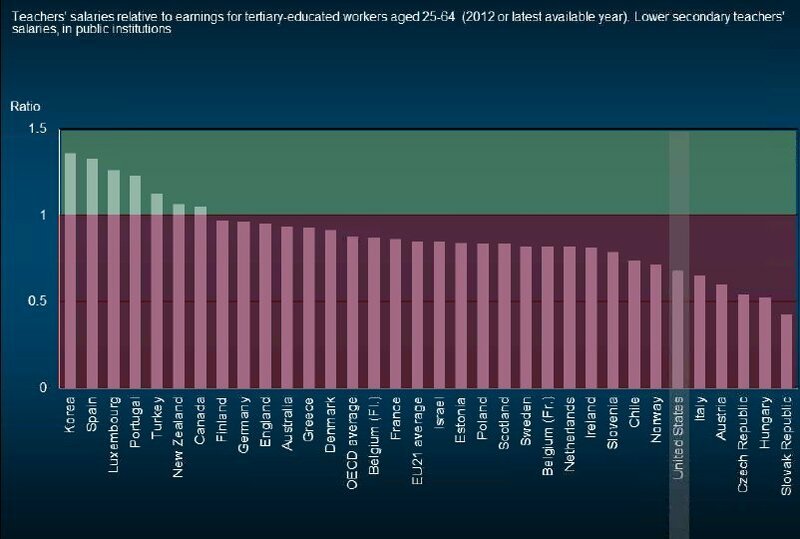 The OECD graphic below shows how teachers' salaries compare with other college-educated workers in each country. The report found that teachers are paid more than comparably educated workers in only seven countries. U.S. teacher pay looks especially bleak when it's calculated over a working career. 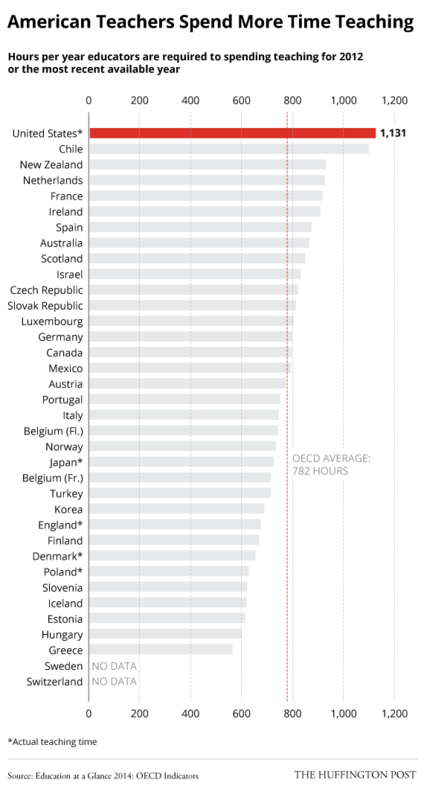 The OECD report shows American teacher salaries increase less than the average of OECD countries after 15 years of experience. A study from the Center for American Progress in July found that slow teacher salary growth contributes to high turnover. Research shows that 13 percent of teachers each year move schools or leave the profession. "The bottom line is that mid- and late-career teachers are not earning what they deserve, nor are they able to gain the salaries that support a middle-class existence," says the report.